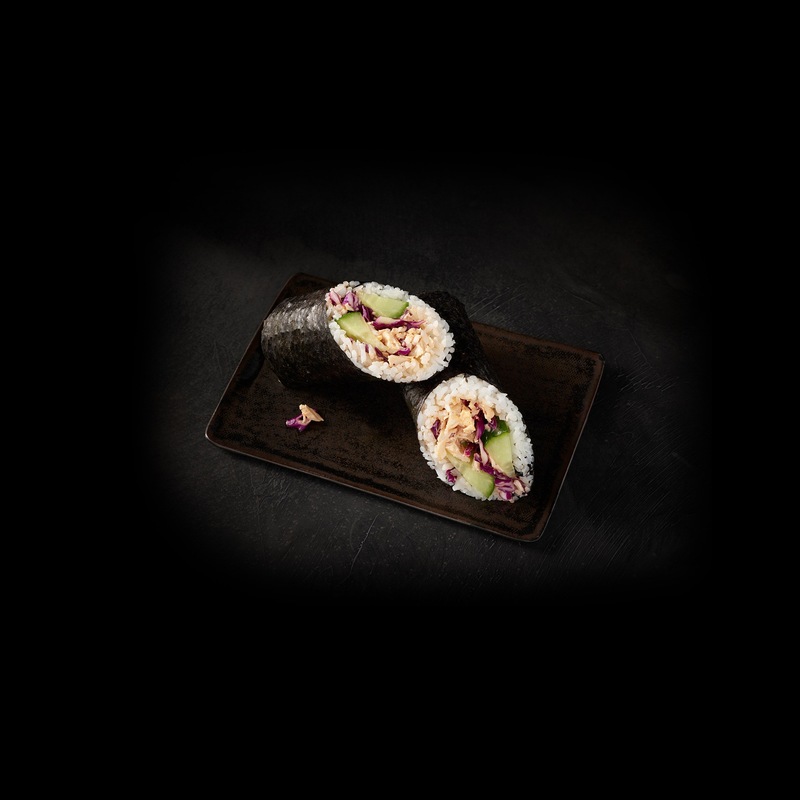 Shredded chicken, creamy avocado, salsa roja, pickled vegetables, crunchy cucumber and crispy onions are rolled up, neat and tidy, surrounded by traditional sushi rice and dried nori seaweed. Our chickens are raised without use of antibiotics. cooked white rice, cucumber, seasoned shredded white meat chicken (white meat chicken, water, chipotle puree [red chili pepper, chipotle peppers, salt, natural smoke flavor], soybean and sunflower oil, tomato paste, guajillo paste [guajillo pepper, water, vinegar, salt, paprika, sodium benzoate, potassium sorbate], salt, vinegar, garlic juice, onion juice, dextrose, sodium phosphate, seasoning [chicken broth, chicken skins, salt, natural flavor, xanthan gum, maltodextrin, gum arabic], paprika, black pepper), seasoned rice vinegar (rice vinegar, water, sugar, salt), lettuce, sriracha mayonnaise (sunflower oil, jalapeno pepper, egg yolks, distilled vinegar, organic cane sugar, salt, water, garlic powder, citric acid), cabbage, seaweed.